Laurens and Wind Chimes share 5/2 betting favouritism odds in our 2018 Sun Chariot Stakes, but the latter’s form in a mixed company makes her the pick of the two in this Newmarket clash. Whether that will be enough to land the odds is another question entirely of course, as so often supposed two-horse races end up going the way of a third, relatively un-tipped contender. 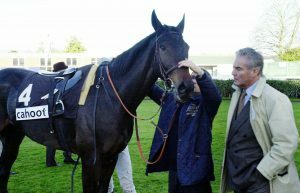 The Sun Chariot has regularly rewarded French raiders over the last decade, with Saphresa winning three in a row for Rod Collet between 2009 and 2011, Siyouma striking for Francois Doumen in 2012 and Andre Fabre’s Esoterique taking the laurels three years ago under Pierre-Charles Boudot. Fabre and Boudot combine with the 120-rated Wind Chimes for this year’s renewal and go to war with the best form in the race, as befits a filly with 4lbs in hand on her closest rival according to the handicapper. Before we look into why that form marks her out as having the beating of multiple Group-1-winning rival Laurens, and whether any of their opponents can make a mockery of the idea the Rowley Mile contest is a head-to-head, let’s take a look at the Sun Chariot betting tips as they stand. Sun Chariot stakes odds: Laurens 5/2, Wind Chimes 5/2, Veracious 9/2, Clemmie 7/1, I Can Fly 9/1, Happily 14/1, Aljazzi 16/1, Billesdon Brook 16/1, Altyn Orda 33/1, Wilamina 40/1. When Fabre’s filly went down by a head to Recoletos in the all-age, open-company Group 1 Prix du Moulin last time out, she had previous top-flight-winning colts Lightning Spear and Without Parole in behind, as well as Expert Eye – that trio’s official ratings: 120, 117, 119. Contrast that with joint-Sun-Chariot-betting favourite Laurens’ last outing, when winning the Group 1 Matron Stakes at Leopardstown. She took the scalp of the 124-rated Alpha Centauri. However, Jessica Harrington’s star miler was revealed afterward to have suffered an injury mid-race. The remainder of the field were rated no better than 111 and all were three-year-old females. Proven against higher-quality opponents in mixed, all age company and with three career races less on the clock, Wind Chimes gets the nod to best Laurens in our Sun Chariot betting tips. Why not read our Prix de l’Arc de Triomphe betting preview? Can any other Sun Chariot contestants eclipse the 5/2 twosome tip? Veracious, third to a fully-fit Alpha Centauri (by seven-and-three-quarter-lengths) at Royal Ascot, has the look of a classic Sir Michael Stoute improver, having raced just five times to date. Held in high esteem having contested Group 1s in her first two races of the season before scoring when dropped to Group 3 level last time out, she could smoothly progress but, at 9/2 odds in the betting, others appeal more. On her first return to the Rowley Mile since shocking the world by landing the 1000 Guineas at HQ in May at 66/1, Billesdon Brook again looks big at 16/1 odds. However, at a 9/1 tip, I Can Fly is fancied to finally live up to the pre-season hype that saw her sent off joint second favourite for the Newmarket mentioned above Classic with Laurens and looks the each-way betting pick. Trained by Aidan O’Brien, the man responsible for the last two winners of the Sun Chariot, she left behind muddling early season form to win with ease in a Leopardstown Group 2 in mid-September and could be poised to take her renaissance up a level. Unfamiliar with Trixie betting? Head over to our Trixie betting guide to get to grips with it.